​Regular or satisfactory attendance is defined as a student missing 5% or less of school in an academic year. This breaks down to 9 days or less in a 180-day year. This is also the equivalent of one day of absence per month. Absences count regardless of whether or not they are excused or unexcused. 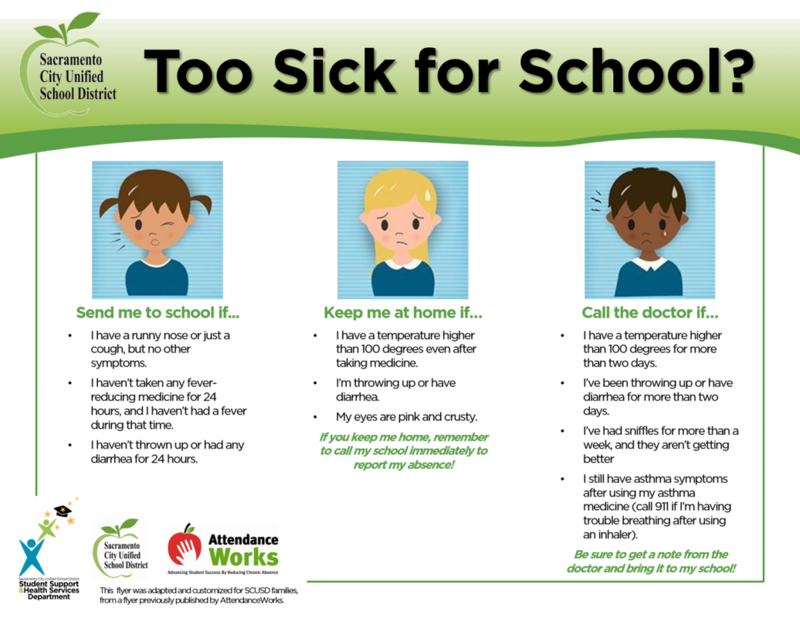 Is my student too sick for school? Minimize activities involving bright lights, excitement, or stress in the hour before bedtime. Restrict cell phones and other electronics from your student's bedroom during sleeping hours. For example, have a charging station in your room where all electronics charge at night. Keep a regular and consistent sleep schedule and bedtime routine, even on weekends. Make your student's bedroom conducive to sleep-dark, cool, and quiet. Avoid your student having caffeine during any time of the day. Avoid you student having large meals before bedtime. Call the attendance office to notify the school. Bring in a doctor's note, if applicable. Have your student check in with every teacher upon return to create a plan to catch up and complete missing work. Talk to your student's teacher(s) if you notice sudden changes in your student's behavior. These could be indicators of something going on at school. Check your student' attendance and grades on Skyward at least once a week (Turn on notifications under your Skyward Account settings). Ask for help from your student's school counselor if you are having trouble getting your student to school.